Leeks are a tender, edible member of the lily family. They have a mild onion taste with a slightly sweet edge and look like monstrously overgrown green onions (a.k.a. scallions). They aren't as widely used in the U.S. as they are in Europe, but they should be. They're versatile, in season for a nice long stretch, and keep very nicely once they're home from the market. In many recipes, you can use leeks in place of onions for a slightly sweeter, milder onion flavor. The more gentle flavor is particularly good in soups. 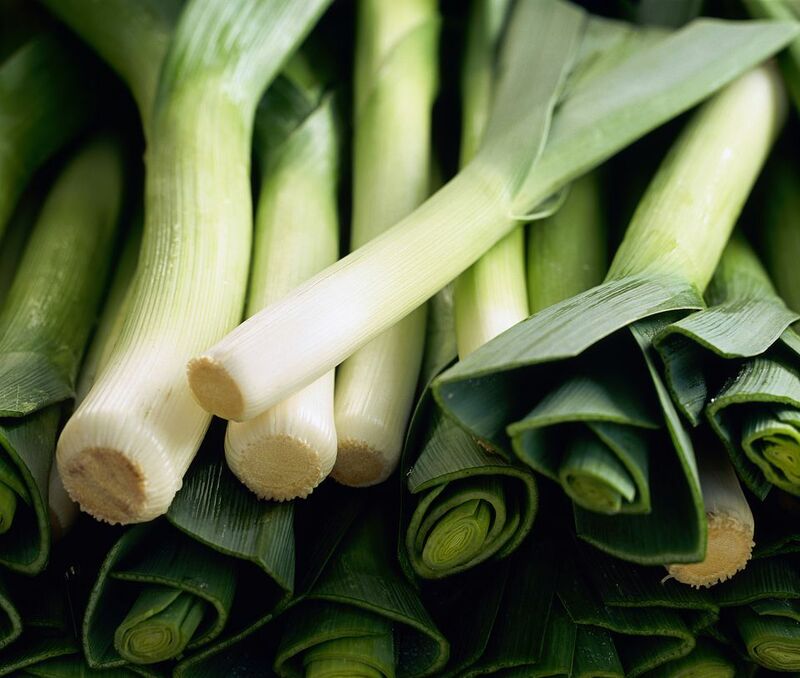 Like scallions, many people only use the white and very light green parts of leeks, reserving the dark green parts for stock or broth. In general, that's the way to go. The darker green parts can be quite tasty, though, when cooked long and slow until they're meltingly tender (as for the filling for these dumplings). Look for leeks in the fall, winter, and into spring. Like many of their onion brethren, they are fairly hearty and can stand a range of growing conditions. Look for slender, straight, firm leeks with leaves that stand up stick-stiff. Leeks more than about 1 1/2 inches wide tend to have tough inner cores with little flavor. The top green leaves should look fresh—avoid leeks with a wilted or yellowing top. Store leeks loosely wrapped in plastic in the refrigerator. Super fresh leeks from a farmers market will keep up to ten days; otherwise, 5 days is a good rule of thumb. There are a couple of ways to clean leeks. Cut into white and light green part of leek lengthwise and rinse under running water. Chop or slice leek, place pieces in a colander and rinse under running water. If cooking leeks whole, trim off dark green leaves and root end. Cut an "x" an inch or two into the root end, and soak leek in a large bowl of cold water for 30 minutes. Any sand or grit will sink to the bottom of the bowl, so lift leeks out of water rather than pouring contents into a colander. Leeks handily come with their own handle to hold onto while chopping or slicing them. Leave the dark green leaves attached to hold these long onion-like vegetables in place while you cut them.